I’m just going to come right out and say it: I couldn’t finish the book. Now, some of you might wonder why I’m posting this even thought I didn’t read the whole thing, and the answer to that is simple – I still have the right to explain why I couldn’t finish it. 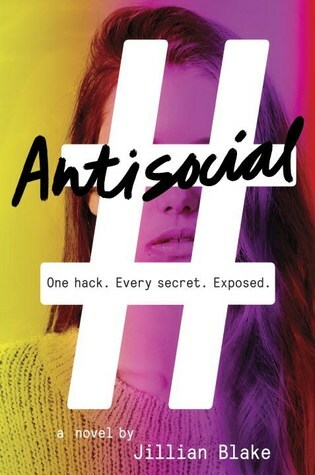 Antisocial was marketed as a “whodunit set in the age of social media and the cloud, ” however, the book failed to capture my attention. I didn’t feel a need to find out what was going on, I didn’t care about the characters, the stakes were meh, and, most of all, the narrative voice shut me out of the story. For me, one of the most important parts of a book is the character voice. If it’s in first person, I want to feel like I can actually envision the character. I want to be able to get behind their motivations, or at least have a strong feeling. With Antisocial, the narrative tone rubbed me the wrong way right off the bat. The opening line of the book, as it stands because I read an ARC, states: “If I seem a little wired or high strung or just plain off, don’t worry. I’m not nuts.” It then goes on to explain how she suffers from social anxiety disorder, and that interacting online is already a nightmare, etc. That wasn’t my issue. My problem was being talked to as a reader, I hate it when the character is telling me something rather than showing the action. Hate it, hate it, hate it. Don’t tell me you’re weird, show it. Long story short, I couldn’t get behind the writing, and it continued that way until I finally gave up. Oh well. Antisocial was meant to be an exciting, whodunit-type mystery. Instead, I sat in the airport and wanted to claw my eyes out (that might be a bit extreme, but oops). I couldn’t get beyond the first few chapters. You can try it out for yourself, you might not be as picky as I am, but proceed with caution.